Makalu has two notable subsidiary peaks. Kangchungtse, or Makalu II, 7,678 m (25,190 ft), lies about 3 km (2 mi) north-northwest of the main summit. Rising about 5 km (3.1 mi) north-northeast of the main summit across a broad plateau, and connected to Kangchungtse by a narrow, 7,200 m saddle, is Chomo Lonzo, 7,804 m (25,604 ft). CLIMBING HISTORY The first attempt on Makalu was made by an American team led by William Siri in the spring of 1954. They attempted the southeast ridge but were turned back at 7,100 m (23,300 ft) by a constant barrage of storms. In the fall of 1954, a French reconnaissance expedition made the first ascents of the subsidiary summits Kangchungtse (October 22: Jean Franco, Lionel Terray, Sirdar Gyaltsen Norbu and Pa Norbu) and Chomo Lonzo (October 30(? ): Jean Couzy and Terray). Makalu was first climbed on May 15, 1955 by Lionel Terray and Jean Couzy of a French expedition led by Jean Franco. Franco, G. Magnone and Sirdar Gyaltsen Norbu summitted the next day, followed by Bouvier, S. Coupe, Leroux and A. Vialatte on the 17th. The French team climbed Makalu by the north face and northeast ridge, via the saddle between Makalu and Kangchungtse (the Makalu-La), establishing the standard route. The first ascent of the southeast ridge route was made by Y. Ozaki and A. Tanaka from a Japanese expedition on May 23, 1970. The very technical West Pillar route was climbed in May, 1971 by Frenchmen B. Mellet and Y. Seigneur. The second ascent of the West Pillar was completed in May, 1980 by John Roskelley (summit), Chris Kopczynski, James States and Kim Momb, without Sherpa support and without bottled oxygen. On or about January 27, 2006, the French mountaineer Jean-Christophe Lafaille disappeared on Makalu while trying to make the first winter ascent. Makalu is one of the harder eight-thousanders, and is considered one of the most difficult mountains in the world to climb. The mountain is notorious for its steep pitches and knife-edged ridges that are completely open to the elements. The final ascent of the summit pyramid involves technical rock climbing. 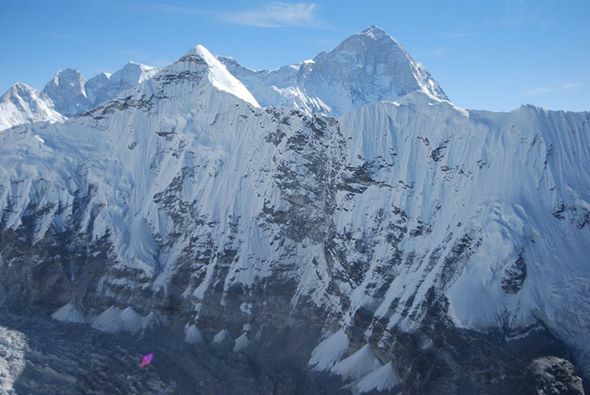 Makalu is the only Nepalese 8,000 m peak which has yet to be climbed in true winter conditions. Day 57 Fly out from Timlingtar to KTM. • Peak permit, all govt. taxes & garbage deposit. • 6 (four) nights hotel in Kathmandu on BB basis. • All airport t/ hotel transfers.